The grass is still brown and the snow still lingering at low elevations in the Rocky Mountain states, but Pennsylvania is bursting into bud and the fragrance of a new spring is all around. Trout season officially opened in the Pocono Mountains of the Keystone State on April 12, and lest anyone think there aren’t big, strong trout on tap, check out waters like Mud Run, a significant tributary of the Lehigh River that flows through the heart of the nearly 4,000-acre Graystones Preserve. The State of Pennsylvania expects to stock around 3.2 million trout this year, most of them in the fingerling size range. But the exclusive waters of Mud Run have been managed by a private family for the last 85+ years. 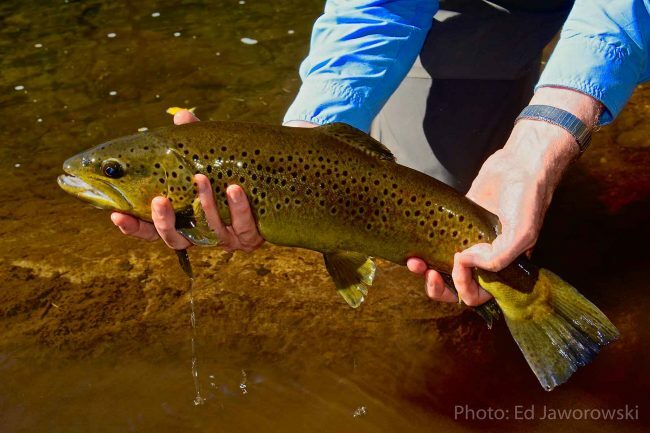 Flowing clear and hard from the 16,000-acre Hickory Run State Park, Mud Run offers solid fly fishing for 20+ inch rainbow, brown, brook and tiger trout in a completely private setting. With long riffles and deep runs, this eastern water provides the devoted fly fisherman challenging angling deep in a pristine landscape. Surrounded on three sides by state parks, there are few private holdings in eastern Pennsylvania that are this large, contiguous and that have maintained their primeval character.